Yes thats exactly what I mean, sorry for not making that more clear. & simply tells the preprocessing function not to merge this actor with the rest of the track mesh. Mostly because said actor will be animated afterward or will be a noncar. &£ is another kind of gameplay object: the powerups. Nothing is needed beside naming it correctly. This is only in C2 has C1 defines powerups inside the text file. It's possible to animate powerups and noncars with a groove too. !! and ! are used to make a material nonsolid. However if the material is used on a horizontal mesh, going through it will activate the default sfx volume, water. !! is always used with water/sea/pool materials but I don't know whether there's a difference with ! or not. > is quite unknown and might only exist in C2. It's the same as above but it won't trigger the default sfx volume when you go through it (when applied on a horizontal mesh I mean). 0-9 activate a material modifier on materials. If there's no number (CRANE.MAT for example) the default material modifier will be used. 0 (0GRASS2.MAT) triggers the first material modifier after the default one, 1 the second, and so on. A\ is probably only effective in C1 (as C2 uses alphachannels anyway). The A letter can be replaced by any letter actually, the \ trigger must be placed as the second character and then followed by two digits telling the percentage of transparency. I know C2 has known materials like R\75GLS.MAT but I doubt it really relies on the percentage defined in the material identifier, it probably just uses a generic texture stored into REG or PIXELMAP (win.pix or glass.win etc idk). It's a Splat Pack only feature, bringing a Splat Pack track into C1 without SP won't render these textures as transparent. but I wonder whether C1 supports polygons rendering as C2 does or simply turns everything back into triangles. Well Tosh, however much i like Carma 1, it's still a game that i have played enough of. So I and a lot of other people would like to see this project eventually turn into a next gen carmageddon game, combining the best of all existing carma games and adding more. There's a big vacuum for this type of game right now and a community made Carma 4 would easily fill it. I'm not rushing though, first things first we need original carmageddon functionality upon which carma 2 stuff should be added later and then eventually stuff like realistic shadows, normal mapping, particles and so on and on. Though for this project to get that far it should be open sourced so that other people can join jeff in development. Carmageddon is one of those games that BEG to be reintroduced to the gaming world, just as Transport Tycoon Deluxe was, these games have three things in common, they were both great in their genre, had awesome replay value and both are old games, heck TTD is from 1994. And I do believe that if TTD turned into a modern multiplayer capable game that tens of thousands of people are playing each day and still holds true to it's root even though it's features have increased by atleast 10 times, then carmageddon can go the same route too. The key to OpenTTDs succes was the fact that it was free and it was opensource, thus there were always people developing it and people playing it. TBH if a fan nextgen Carmageddon was so needed/possible it'd be already in development. Also I remember a lot of little projects here and there trying to create a nextgen Carmageddon on moddable engines, they never get finished. Probably because a carmageddon-type game isn't that much interesting after all and doesn't attract developpers. YOU really want a nextgen Carmageddon. And a few of us too ofcourse. But not so much out there. Else SCi wouldn't have canned the C4 project or at least someone would have tried to fill that vacuum. My bet is that nobody will do better than C1 & C2 carmageddon-wise. Just look at this project correctly: Jeff wants to do an open C1, make it work on modern systems easily, maybe crossplatform, and add some features besides all the original ones. Further I guess it might be intersting to have a proper and modern netcode, but it is not the time yet. The aim isn't to create a nextgen Carmageddon engine, I'm sure the project should be started totaly differently than Jeff started it, it would require a lot lot more work, even with many other people on the project. All that knowing that there's a near 100% chances that SCi forces the project to stop. This is "just" an open C1 project. It is enough in my eyes. What's the point of a nextgen Carmageddon that doesn't feel like the real thing, gameplay being the same, when you can have the real Carmageddon working properly. Adding detachables and 3D peds, this is C2 then. Making an open C2 is already way more difficult: deformation engine, lighting system, peds animations, much more features. Let alone turning it into a 2009 nextgen game, that's insane. This is all just my opinion and I don't want to reply instead of Jeff. Finishing the openC1 is a good enough project, no need to hassle Jeff about adding nonC1 features. If someone wants to start a nextgen Carmageddon on this project, I guess that person will be able to create a fork when the project goes opensource. Personaly, I'd like to see this openC1 as what Fitzquake is to the original Quake: an open source port of the game fixing bugs, removing limitations, adding a few conveniences for modders and users, but still being like the original game. Something simple that works. That is what i said that first things first a straight port is what is needed and i never told that jeff should do everything alone. that is insane, that is why you do opensource, so that you have a chance of someone joining in to help developing effort. Also if jeff doesn't decompile c1 and somehow use it's code to make this game then all he needs to do is change the name and use user created models to test things, SCi can do nothing about it then as he breaks no law at all, it's just HIS stuff and none of theirs. ReactOS is done this way and is Microsoft bitching about it? No they are not because even if it does exactly what windows xp does it's still made from scratch and thus legal. What Errol did was actually breaking ip laws i think. As using names and designs from the original game is actually ripping off the authors. Heck if they wanted they could make Econo remove all the eagle and hawk remakes he has on his site as they too are infriging on SCi's rights. Alright, I ofcourse agree with your points and all, but I feel like your enthusiasm and my pessimism do the difference in our point of views. Anyway, the important point in my eyes is: so far Jeff never told he was interested leading this project towards a nextgen Carmageddon engine at any point. Ofcourse such a project wouldn't be done alone and would be started after the initial project is completed. But seeing Jeff only wanted to do an openC1, I don't think what he will have achieved will motivate anybody else to create a fork aiming at a featureful Carma engine because there still will be a huge lot of work, implying things could be started from scratch again for the best. If I had to be as optimistic as you, I'd say... hell yeah let's complete the project afterward with nextgen features, ala DarkPlaces (I'm not especially looking forward for this, but it'd be an interesting project). With existing libraries I'm sure it'd be "easy" for a coder to implement everything you suggested in your previous messages. But... will there be someone to do that? And will that someone (or team) be able to recreate the right Carmageddon feeling? Won't it be another mirage? BTW why do you think there's so much people looking forward for a nextgen Carmageddon? 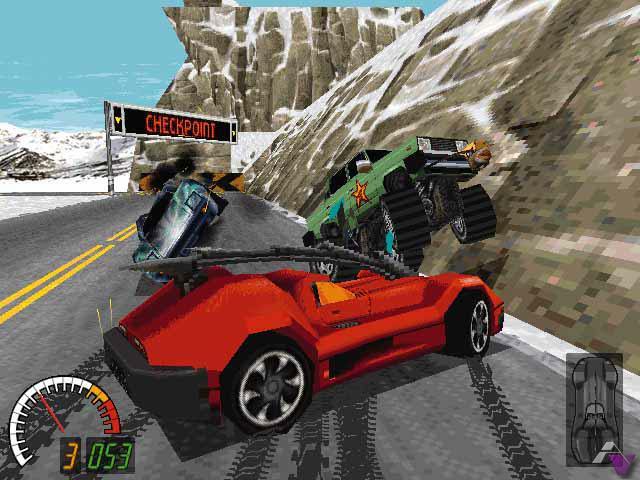 Everytime I read/see people remembering Carmageddon, it looks like a good part of nostalgia but no one really seems to be willing to play such an oldschool arcade game again. Even on nowadays handelds, people would be complaining about how repetitive it is. I think such games can't exist anymore. We are just still there because we enjoy modding the game and see our creations in such a gameplay?! Part of the unwillingness to play is due to the game being not easy to actually run on todays systems, people who run it are usually people who know how to use things like dos box or other software and these are not too common among pc users. Also the whole Linux port idea is what could bring a lot of players as there aren't many good games that work natively on Linux. And about cwa never completing a project - well if we keep not doing things because in the past we failed then we will never get anything done. Hope should die last. Also Quake by modern standards is a linear repetative game just as doom is, but both have good remakes and i don't know about quake but Skulltag for doom has quite some players despite the fact how simple the game itself is. My interest is in re-implementing the Carmageddon 1/SP engine in modern code. I'd prefer to keep the same look and feel (with options for high-res textures and models) and add mod-ability and features. As tosh says, even if we reach 100% C1 implementation, thats a huge way away even from c2, let alone a really modern engine. Forget it jeff. The LAST thing you need is SCi here. When C1 engine is redone, make sure to rename it to something else that would still be in spirit of carmageddon and then together with the community accumulate content like cars and tracks and just go indie with it. Actually I suggest renaming the project as soon as possible, SCi is quite happy to send C&D letters. I thnk you should keep it called Carmageddon, if you get anything from SCi, then just change the name then. So SCi is pretty crazy about protecting their old copyrights? This one shows a load of hard work integrating PhysX. Its not perfect, but I'm pretty happy with it so far. I've got noncars working, so can now smash lampposts, crossing signs, trees etc. Haven't yet implemented the bending part (eg lampposts should bend before breaking), but hopefully its not too hard to do. Wow, pretty speedy work. Nice one. You know I think SCI tried to hard to get popularity that they lost the one thing every one loved I know they could do better than TDR I really think they should put out a revamp that proves that they can still make a game worth playing. Anyone know which pixmap contains the speedo image in this screenshot? Good luck getting the hud up. nice work Jeff. I was thinking, are there no grooves used in any of the tracks? Rotating signs, flapping doors? There are some, but not many. Most of the track grooves are those 4-legged cranes in Indust and Mine races. Coast has those floating yachts, and CityB3 has a rotating crane. Anyway, heres the latest video. It shows grooves and funks on both cars and tracks. Also shows some signs being pushed over. That part doesnt work like the original game yet, where they should bend a certain amount before detaching. Wow, I really want to play this. You're doing a great job with this! This is great work Jeff. I can see more of the game coming to life with these animations. Ivans blade seems like a complicated one indeed. Guess it are two animations working together? The tacho is also working? Do you already have ideas about the ai? I remember seeing that video a long time ago. i've started posting carmaXNA progress to my blog, but will post here too whenever I make an update.